Amazon has this week launched their new Amazon Fire TV in the UK And Germany making it available to pre-order for £79 or €99. that has been designed to connect to a HDMI port on your HDTV to provide streaming services to your home. If you area an Amazon Prime member at a discounted rate of £49, but don’t delay as the Amazon Prime Fire TV discount only last until Monday 8th September. The new Amazon Fire TV will start shipping on Spetember 25th in Germany and October 23rd in the UK and is the same hardware that was launched in the US earlier this year. To re-cap the Amazon Fire TV set-top box is powered by a Qualcomm Snapdragon 600 processor supported by 2GB of RAM and comes with 8GB of internal storage. Other features of the Fire TV device include wireless and Bluetooth connectivity together with a handy Ethernet port. The European version of the Fire TV set-top box will provide users with access to content that is not available within the United States and vice versa. Enabling users to access services such as Amazon Instant Video, Netflix, Spotify, Vevo, Bloomberg and more. 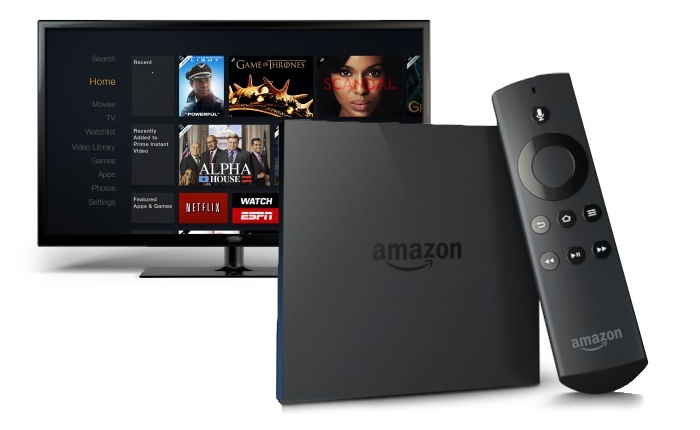 For more information on the new Amazon Fire TV jump over to the Amazon website for details.